Spotted this guy a few weeks back in Merriitt Island during a hiking trip. It was a very foggy morning and we barely noticed him hiding in the weeds (first picture). Waited about 20 minutes and he finally came out of the weeds as he walked across the swampy marsh...stopping to look back at us when he noticed us. Nice work on both shots. As usual patience pays dividends in the end. A Photographer that is fluent in Sarcasm. ive only seen 1 wild bobcat and it was just its rear end as it crossed the road and back in to the weeds. Please feel free to edit or change any of my pictures to show me how to improve them. Great capture. The second shot is awesome. Eric D, great images, particular the second one which I would be framing and mounting on my wall if it was mine. Beautiful shots both, I really like the first one with the face blending into the grass. Very cool. Great work, Eric. 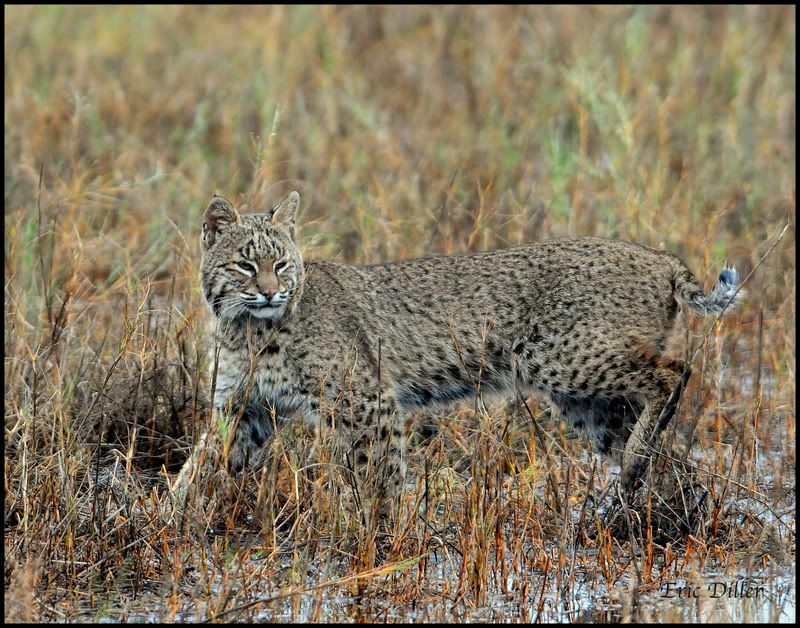 I've lived in Florida all of my life and only seen a bobcat on a few occasions; and never with a camera in my hands. I have a couple questions, if you don't mind me asking. The exif shows 500mm. Did you hand hold these shots or use a tripod? What lens did you use? How do you like your D300? Good captures, good clarity and good persistence. Thanx for sharing. First of all ....thanks for the comments. I love D300!! I used my nikkor 300mm,2.8 with a 1.7 teleconverter. Had to use a mono pod so i could keep a low profile and out of site. Was a total rush when I spotted him!! What a find! Excellent job. I love the setting in #1. If one of the pupils was unobstructed, it would have been even better. If you have shot with both pupils showing, it would be a "10". But I'd be happy just getting to see one in the wild, let alone getting a shot off. That is a very rare experience for sure. I tracked a bobcat for a whole summer before I seen it!! Great Capture! As much time as I spend in the swamps and marshes here, I've never seen one! Congrats! Congrats on the FP! Well deserved on this one for sure. I'd love to see one of these guys out there! Pretty cat and nice pictures! I wanna take picture like that. Wow! 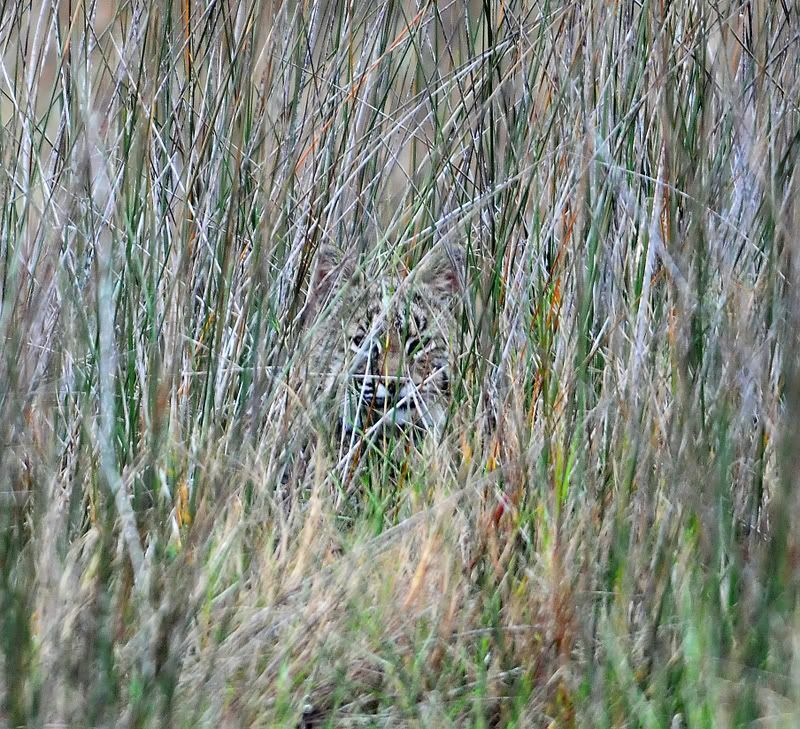 sneaky bobcat. that's look amazing. you have captured a very good photo. shooting these photo need a lot of patience and courage. keep it up and share with us more photo. Can somebody please check the other thread as some members or rather should I say robots leave their personal links.